AMT Marine Software Inc. (AMT) is pleased to announce successful commissioning of Autoload loading computer software on board m/v “AAL Brisbane”. 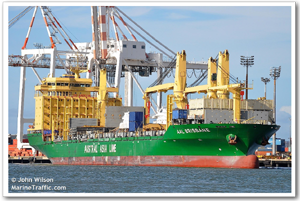 The m/v “AAL Brisbane” was built at Huanghai Shipbuilding Co. for Columbia Ship Management (CSM) and is joining Austral Asia Line’s (AAL) fleet serving their break bulk cargo customers in the Asia – Australia trade. The “AAL Brisbane” is the first in a series of 10 new 31,000 DWT multipurpose vessels specifically designed to cater for break bulk liner, large-dimensional and heavy-lift project cargoes (up to 700 MT lifting capacity) as well as bulk commodities and container cargoes, in other words the ultimate in cargo carriage flexibility. Autoload is the market-leading onboard stability and stowage planning software developed by Autoship Systems Corp. In one application it integrates sophisticated cargo planning tools for all types of cargo and advanced stability analysis module. One of the distinctive features of this installation is the ability to simulate lifting and precise positioning of oversized and overweight cargo with one or two heavy-lift cranes in 3-dimensional graphical view with instant control over the crane’s SWL, lifting parameters and ship’s hydrostatics. On board m/v “AAL Brisbane” the loading computer is linked to HOPPE tank and draft sensors system that allows real-time monitoring of ship’s loading condition and floating status. Autoload is also used in the AAL regional offices for cargo estimates and preliminary ship planning. Having the same loading software on board the ship and in the operational offices makes the cargo planning process transparent, better coordinated and efficient. 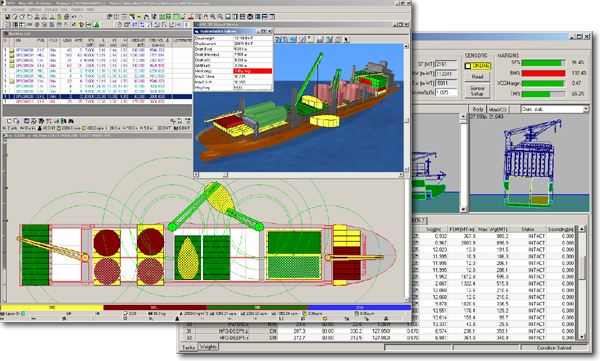 In this project AMT Marine Software has provided full cycle of technical services: custom configuration of Autoload’s functionality for the ship; development of detailed 3D ship model; installation and training on board; certification of the loading computer with Class; and is rendering on-going support of Autoload users on board and ashore.